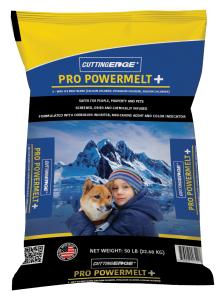 Cutting Edge® Pro PowerMelt + is a proprietary formula made from a three-way blend of sodium chloride crystals infused with calcium chloride and potassium chloride, creating an ice melt solution that is safer for people, property and pets that melts at up to -12 degrees Fahrenheit. A non-magnesium product, Cutting Edge® Pro PowerMelt + is specially formulated with a corrosion inhibitor to reduce damage to concrete and property. It also contains an anti-caking agent and is coated with a green color indicator to ensure cost effective, even dispersion. Designed to stay where applied, our ice melt won’t track onto carpets and flooring. Its longer shelf life and easy dispersion through a spreader makes our ice melt a great choice for commercial or residential use; melting ice and snow quickly, and providing no-slip protection, a two-step heating process that provides a long-lasting defense against ice on driveways, sidewalks, steps, or anywhere it’s applied. Our unique UV and water-resistant, non-slip packaging provides extra protection for outdoor storage and can last year after year to provide safe and effective ice melt protection. Available in pallets of 25lb bulk ice melt bags.